All of our amulets are guaranteed authentic, and either straight from the temple or from very reliable sources including dealers and collectors around Thailand with whom we are afilliated. Once your payment has been confirmed by paypal or your bank transfer or credit card payment is confirmed by us, we will send your amulet by airmail registered post which will arrive in 10 -14 days in most cases to your doorstep. Some countries may sometimes take longer, so we state a maximum of 28 days, but most cases will arrive in under 2 weeks. Secure Transactions – all Online Transactions using credit card or debit cards go over a https server which is recognized by visa, mastercard and paypal and is secure worldwide accepted transaction server software which is operated through amazon.coms ‘ecwid’ project. We cannot send Buddha Images over 5 cm out of Thailand, but we can provide Bucha Statues of other sorts, which are of Gumarn Tong, Deities and Monk Images. Images in direct representation of Lord Buddha himself are not permitted. 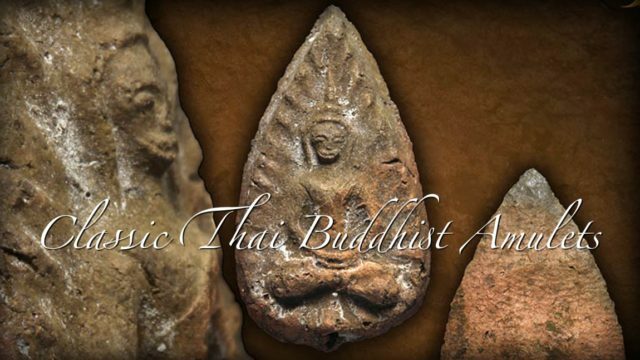 Thailand Amulets.Net is the property of Mr. Spencer Littlewood, who wishes his connection with this website and amulet store to be known, in order to increase the assurance that his Customers will feel through knowing him and his reputation and accumulated knowledge (and publications). In the age of buying things on the Internet, many people feel distrustful of a website (rightly so sometimes). Mr. Littlewood has accumulated respect in his field as a Moral Publisher of Thai Spiritual Topics, including sak yant tattoos, Thai Buddhist Amulets, Brahmanism and Animism in Thailand and Thai Mythology. He is in the process of starting a Thai Buddhist Lersi Ashram in Chonburi, Thailand and in conjunction with the Sak Yant Foundation and Buddha Magic Project Museums and Showcases, hopes to build a place of practice, in order to assist in enabling the possibility for Foreigners to come, and practice the Dhamma, and learn Kammathana Vipassana techniques. Thailand-Amulets.Net is his attempt to keep his family, as well as to use funds to promote Buddhism and the practice of Buddhist Mindfulness Meditation through various projects in various temples. Spencer wishes his true initention towards the trading of amulets to be known and that a large part of any funds recieved from this website go back into projects with the Buddha Magic Project, The Sak Yant Foundation Project, and the to help the spread of Buddhism. Spencer Littlewood wishes to express his thanks for the double-merit of generosity to all customers and friends with thailand-amulets.net (synonimous with Spencer himself). Thanks for keeping his family afloat, and thanks for keeping the Triple Gem of Buddha Dhamma and Sangha alive and flourishing by enabling Buddhist art and sacred artifacts to continue being created and used as a method of Merit making and Maintaining the Buddha Sasana in healthy condition. All dedications of Merits he makes at any temple or before any Buddha, are always made thinking of the people who practice their generosity getting amulets from thailand amulets dot net, and the dedications are made towards them, as well as all other Sentient Beings of course.